Features:*Sleek,lightweight&portable,designed for standard cutting of paper, photos or labels* Capable of cutting a 45-degree to 90-degree angle* Max cut 12 sheets paper (80g/m2) , Perfect for mixed media projects! * Plastic cutting surface improves scale visibility for accurate measurements. * Patented Track System interlocks the blade and rail for cuts that are straight and steady. * Cutting through chipboard, card stock, ideal for home Office functions or craft projects.Specification:Color: BlackMaterial: Plastic + AlloySize: 45 * 17.5 * 3cm/17.8 x 7 x 2 inchesMaximum Cutter Width: 31cm/12.20 inchWeight: 380g / 0.84 lbPackage:1* Black Paper Trimmer (Instruction in the back of package). Designed to cut A2 A3 A4 A5 paper, photos, labels, cards and more, the trimmer can cleanly cut through thicker materials with ease. Capable of cutting a 45-degree to 90-degree angle. 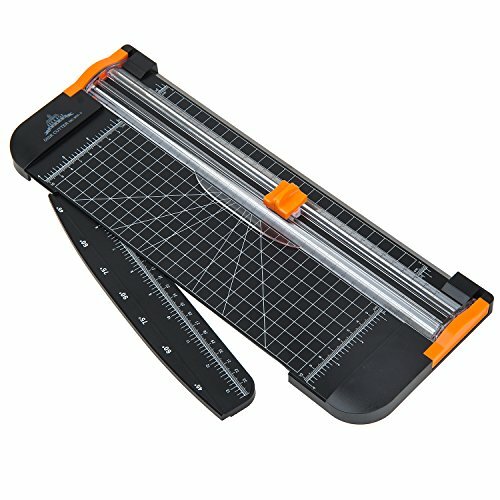 Features Sharp trimming mechanism and ruler precision measurements for perfect scaled trimming. Light weight and versatile, the paper cutter also includes a protective rail guard and latch hook lock to protect users. Cutting through chipboard, card stock, ideal for home Office functions or craft projects. If you have any questions about this product by Jielisi, contact us by completing and submitting the form below. If you are looking for a specif part number, please include it with your message.